← New 2019 offer inside…up to $1,000 value! Bev Fearis fulfills her dream to stay at the original Icehotel when she heads north into the Arctic Circle on the next leg of her Lapland Adventure with www.VisitLapland.com, a new website and one-stop booking portal to help travellers and agents check availability and book activities from across the Lapland region of Sweden, Norway and Finland. Even though we weren’t in our thermals, it seemed wrong not to brave the cold and stop the mini bus for a quick photo at the point where we crossed into the Arctic Circle. We were heading north to Kiruna, a town famous for its underground iron ore mine and also for being the home of the original Icehotel, which is actually just over 10 miles outside the town in Jukkasjarvi. Our four-hour drive took us past the most beautiful snow-covered landscapes of forests and frozen lakes, and we even spotted some reindeer on the edge of the forest. We arrived at the Icehotel mid-afternoon, just as the sun was starting to drop, giving it a warm violet glow. 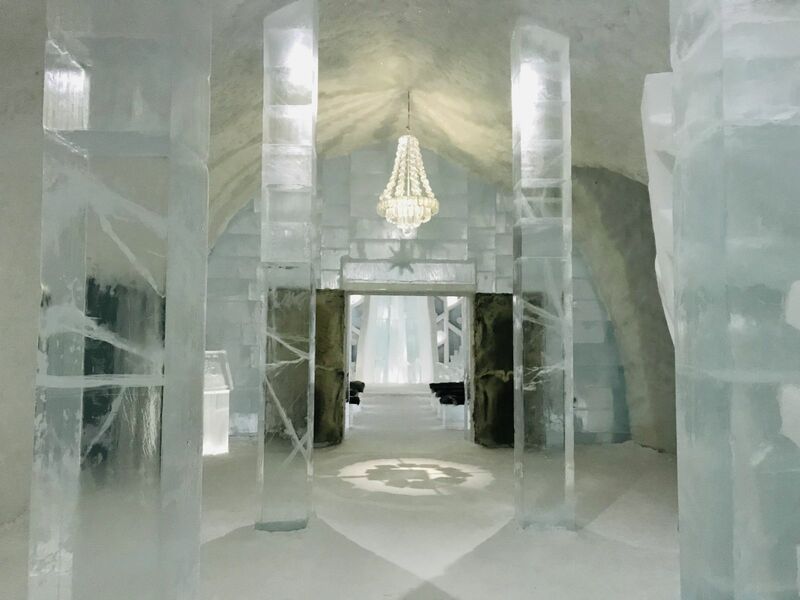 It wasn’t as remote as I had expected – it’s actually just off the road that runs through the village – and it was busy with people coming and going, some day trippers on tours and others returning from activities, dressed in their Icehotel overalls. There are actually two hotels. 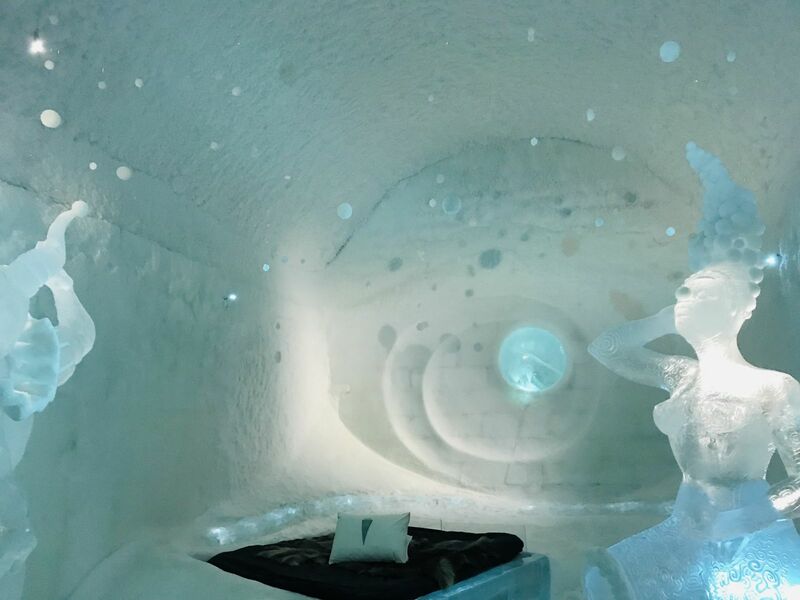 The original Icehotel is built from new each winter and then melts again when spring arrives. It celebrates its 30th anniversary next winter. 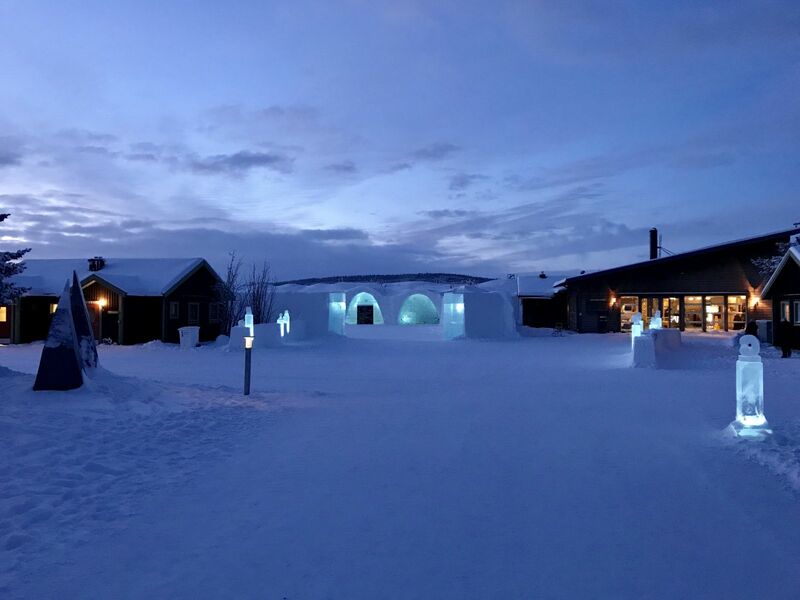 The second, Icehotel 365, opened in November 2016 and, thanks to solar energy, welcomes guests year-round. Both are built with several hundred tonnes of ice from the neighbouring Torne River. The ice is crystal clear because the river is so fast flowing. 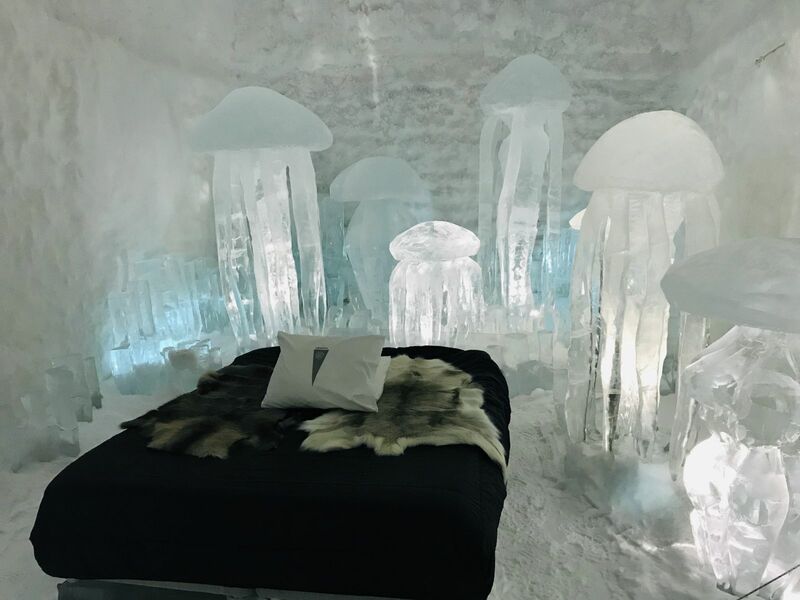 Temperatures inside both hotels are kept at -5 to -7 C so guests are given expedition-style sleeping bags to cope with extreme temperatures and are advised to sleep in thermals, hat, warm socks and a mid-layer jumper. On arrival, we were directed to a warm reception block and were each given a keycard for our personal storage and changing cubicle. Opposite were shower rooms – male and female – and saunas. A few people were taking the chance to get some sleep on the sofas in the communal lounge area. It didn’t bode well for our night ahead. We put on some extra layers and set off for a tour of the two hotels, famous for their ice sculptures made by 34 artists from 13 countries. We gasped at the giant chandeliers, towering columns, a chapel with a Krypton-style altar, and corridors of bedrooms showcasing glittering ice creations on themes ranging from sharks and jellyfish to sweet shops, VW camper vans and Victorian libraries, each one with a double ice bed holding a mattress covered in reindeer skins. 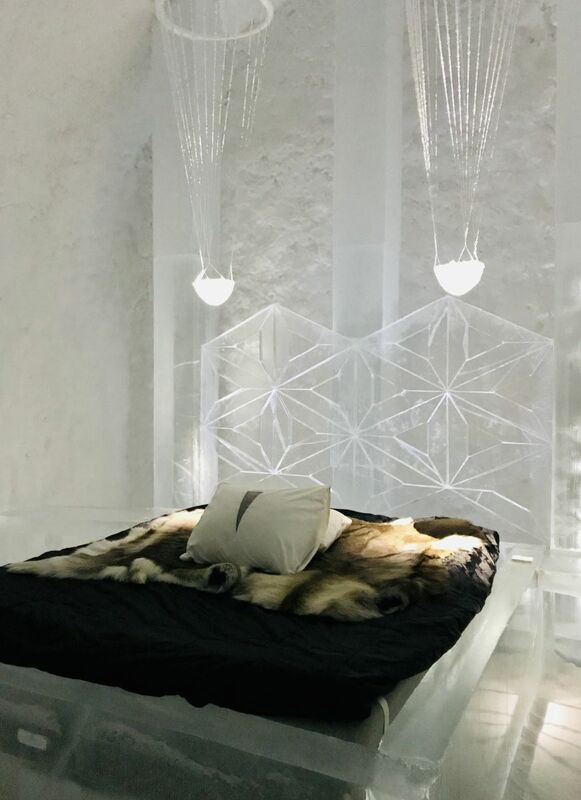 I got a glimpse of my room, one of the Art Suites in Icehotel 365. It’s the only one where music is part of the installation. Called Dancers in the Dark, it is by Swedish artists Tjasa Gusfors and French-born Patrick Dallard and is dominated by two dancing clowns. A song plays when the lights are switched on. I thought it was Bjork, but apparently it was written and performed by Tjasa herself.